Samsung Galaxy Star Pro S7262 is a great budget smartphone from Samsung which houses with 4 inch of capacitive touch screen, 512 MB of RAM, 4 GB of internal storage memory,along with memory expansion and 2 MP of camera. And many people use it as a secondary smartphone because its easy to carry, packs beautifully in your hand and also, the phone looks good, although it has a typical Sammy look. So, here, we are bringing a very good news for Galaxy Start Pro users,. Now, you can upgrade your phone to Android 4.4 Kitkat, by carefully following this tutorial. It is very simple, and won’t cost you anything. 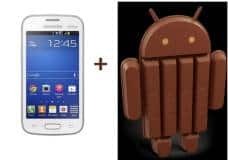 Officially Android 4.4 KitKat is available only to few high end smartphones and tablets like Nexus 5 and Galaxy S3, HTC One 2014 and a few,but now you can also have the sweet crunchy flavor of this phone. Make sure your device has rooted, you can root in the way you want. Make sure you have installed the latest version of the CWM recovery on your Samsung Galaxy Star Pro. Data back up is very much essential when you go for these kind of flashing process, I would suggest you to use Titanium backup to manually create a complete backup of your device, however if you need a more simple app you can use this. Enable USB debugging mode via the settings menu. Make sure to charge your device at least up to 80%. Plugin your Samsung Galaxy Star Pro to your computer via USB and copy the file you have just downloaded to the device’s SD card, do not extract the zip file. Now Switch Off your device and reboot into recovery mode by pressing Volume Up+Power+Home key simultaneously until you see the boot logo on your device’s screen. Now go to the recovery option and perform a full factory reset. Now Wipe cache partition and wipe Dalvik cache. Now you can flash the ROM by selecting the option install from zip from SD card option which I believe is the simplest way. It will ask you to provide the zip file, browse the ROM file and hit enter to begin the installation. Now repeat the above step again to flash Google Apps. Let the process to complete, don’t try to do much with your device at this stage until it shows “Installation completed”. Now, it will take some time to reboot. Have some patience and wait for it. And you’re finished with upgrading to Kitkat, now enjoy the latest version of Android on your budget phone.